"Just because you're paranoid doesn't mean they aren't after you", as a stats man I'm a fairly rational guy and talk of an anti-Swansea agenda from referees, the FA etc., usually has me shaking my head, but what I saw Loftus Road was a bit of a farce. I was at the other end of the ground but I could tell Rob Green saved outside the box so I have no idea how the officials missed it, I can only only assume they saw it but didn't think anything of a goalkeeper making a diving save and forgot to check whether he was inside the box. The other options, that they just didn't notice or thought the handball was unintentional are arguably even worse decisions. If we move away from foaming at the mouth anger and try and look at recent decisions rationally, there's still plenty to be angry about but some of the decisions made are understandable (even if they were wrong). Karl Henry almost goes through Routledge but thanks to Wayne's quick reactions he doesn't get hurt although understandably does lose his rag. Arguably Henry could see red for a very dangerous challenge, but usually the lack of contact means it'd be a yellow. Routledge does move his foot towards Henry and perhaps from the linesman's view looks like he made contact, so completely wrong decision but not totally imagined (update: Red has now correctly been rescinded). Depending on the level of burden of proof, I'd say it's probably more likely than not that Shelvey meant to swing an arm at Can and seeing as the FA have a 99% conviction rate when they bring these kind of charges it would have been crazy to appeal considering 2 of the 4 games missed where QPR and Tranmere where Shelvey would either be unlikely to play or not as important for the Cup game. I'm pretty sure the ref saw it but made the call that it wasn't deliberate, I assume he gets to watch the incident (or at least hear about it) before writing his report so can choose to include it or not. For incidents like that, full speed and slo-mo look completley different so possibly the ref could argue that he didn't see exactly what happend so it could be retrospectively punished. Sterling's slap while technically a red, he probably got away with because of the complete non-reaction from Fernandez, so it looked more like a toddler having a tantrum than violent conduct. Worse for me was the little nudge from Sterling that pushes Fernadez off the pitch where there is little space between pitch and the crowd and was a bit of a cheap shot. Also, as it was obviously seen, there's no chance of any retrospective action. If you ignore the hand-ball in the build up (if you don't Ash probably gets sent off instead), then Fabianski's challenge was a foul and rightly a red. If you start to rescind Red cards based on earlier phases then you'd end up arguing that a Red shouldn't happen as a throw was assigned the wrong way 30 seconds earlier. It's a bit crap, but it's the rules. This was rightfully rescinded although I do have a small bit of sympathy for the referee, Coutinho loses control of the ball and creates a 50-50 situation where as I watched it I expected a lunging two footed tackle. Fernandez being an Argentinian international defender rather than a non-league clogger clears the ball safely but I can only assume the ref in the moments before the challenge is expecting a lunge and so goes with what he's expecting rather than what actually happens. Moses cheats and the ref falls for it, although Rangel's hands are close enough to Moses' back to make it look realistic at full speed. Of these 3, only Rangel could complain about their second yellow and again was harsh rather than completely made up. It's probably not a coincidence that all but one of these incidents was away from home, when it comes to split second calls, crowd reaction is bound to have some effect. If you assume that officials make 1 gigantic balls up every couple of games, then there's bound to be a team that over a short period of time seems to get everything going against them in a similar way to how Newcastle put runs together of being incredible or terrible when in reality they are an average team. Back to the match yesterday and even with 5-10 minutes left and a goal down (but with 11 men), I felt that we could still get 3 points. This was an odd game with 49 efforts (second highest in league after QPR-Leicester) but didn't feel like a game full of quality chances (or quality at all). Gomis starting was a bit of a surprise but made some sense in that Dunne has the turning circle of a supertanker so more pace through the middle was a valid idea, it also could be thought of as a show of confidence in Gomis ahead of him being the main striker for the next 6 weeks or so. This was an odd game in that it felt all the way through that if we could just string a few passes together we'd tear them to pieces, how much of that was bad passing (there was certainly some of that) and how much was organised work from the QPR midfield would need another watch. 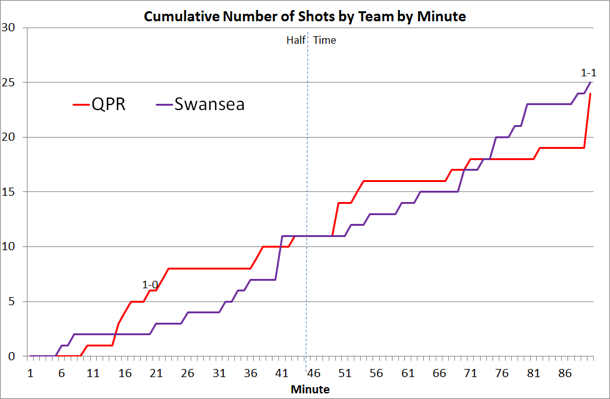 The only plus point about the Routledge red was that it made Bony's equaliser even more enjoyable, although the 4 shot scramble by QPR at the end of the game could have made it a pretty sour start to the year. It's going to be a tough few weeks with a stretched squad, but could give the likes of Barrow/Carroll a real opportunity for a run of games.